Please refer to our stock # D446 when inquiring. 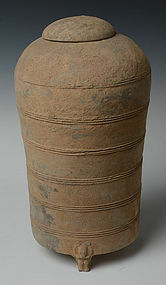 Chinese pottery granary jar, with cyclindrical shape, decorated with bands of incised lines, and supported by three legs. Measurement: Height 43.5 C.M. / Width 24 C.M.